Saturday at the old house I prepared smørrebrød with Skagenrøre as a traditional Danish "frokost." I prepared the salad from this delicious recipe, named after the charming, small town of Skagen located on the northern most point of Denmark. 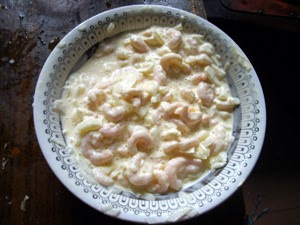 This mayonnaise based shrimp salad is one of many similar recipes prepared in Scandinavia (and beyond) using many different crustacea (crayfish, lobster, crab, etc). 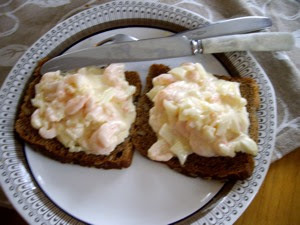 I used all the traditional ingredients supposed to be in a genuine Skagenrøre, except red caviar. It is particularly delicious if you use the caviar variety with the big translucent eggs, but the cheaper varieties works as well. 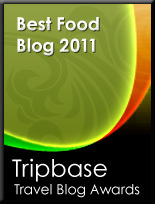 Mix the dried ingredients, then add the mayonnaise. Mix well, then add lime juice, pepper and chili sauce. Add more salt or pepper after your taste. Allow to cool down. If you would like a leaner salad, substitute half the mayonnaise with a low fat mayonnaise or sour cream. If so add more salt and pepper to taste if necessary. 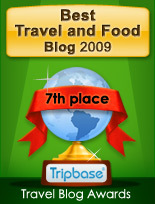 Place two slices of rye bread on a plate. Spoon generous amounts of Skagenrøre over. If you follow the Danish smørrebrød tradition the slice of bread shall be completely covered by the salad. And what to drink? Beer, of course. 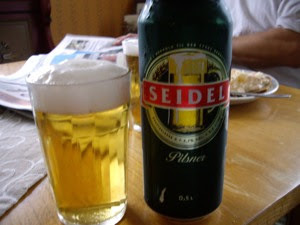 This variety is the inexpensive Seidel variety we have available but any pilsener type beer will do. And a cold glass of Aquavit may also be enjoyed according to tradition.